Avid collector, Andrew Hawley from Vintage Rock Posters, announces his search for original Original 1965 Eric Von Schmidt, Bob Dylan and Joan Baez concert posters. 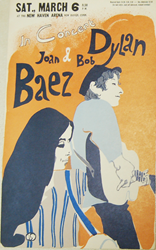 Eric Von Schmidt donated this poster to honor the joint Dylan and Baez tour that year. 1965 was a transformative year for Bob Dylan. With the release of two albums, he was moving away from Baez's shadow and becoming a leading folk music hero on his own merit. Avid collector, Andrew Hawley from Vintage Rock Posters, announces his search for original 1965 Eric Von Schmidt, Bob Dylan and Joan Baez concert posters. Eric Von Schmidt donated this poster to honor the joint Dylan and Baez tour that year. During their joint tour, Dylan and Baez played in Philadelphia, New Haven, Newark, Ottawa, and ending with two shows in Pittsburg. According to Hawley, "1965 was a transformative year for Bob Dylan. With the release of two albums, he was moving away from Baez's shadow and becoming a leading folk music hero on his own merit. Dylan took a sharp turn in July that rocked the folk music world when he went electric at the Newport Folk Festival. In November, he married his first wife Sara Lowndes under an oak tree on Long Island. It is rumored that Dylan did not like the Toulouse-Lautrec like poster. This is not surprising since the poster probably a step behind what was going on is Dylan's life and music direction in 1965." Hawley will pay $5,000 for original Eric Von Schmidt Bob Dylan and Joan Baez concert poster from New Haven Arena or any other of the cities where they played in the spring of 1965. Any condition is accepted.Please call 310-346-1965 or email andrew (at) vintageconcertposterbuyer.com.